← Earl Grey’s Irish Famine Orphans (3): Organization cont. A good while ago, in 1985, I expressed the hope that the story of the female orphans might be written from the orphans’ own point of view. A colleague pointed out to me I was still saying the same thing last year, in 2013, when I gave an address to the International Irish Famine seminar in Sydney. I’m afraid this is not my attempt to do just that. In spite of my own misgivings, I’ll try to put the young women in some kind of context. In this case an Irish one–Irish women and emigration, the Famine tragedy and the workhouse, that kind of thing. It is the background they came from; it’s what made them orphans. My big fear is that I won’t come even close to answering who the young women were. That’s a philosophical question in itself. Maybe it’s best to write something down; it can always be reworked at some future date. I mentioned before there were precedents for the Earl Grey female orphan scheme, for example, the young women who came to Australia from Foundling Hospitals and other charitable institutions in Cork and Dublin in the 1830s or the eight thousand(?) or so who came as part of the ‘vast’ influx of Bounty migrants in the early 1840s. Uniquely among Australia’s immigrants in the nineteenth century, the Irish were to achieve a gender balance, that is, as many females came to Australia from Ireland as did males. Any shortfall was always made up by transfusions of female blood such as the 1830s women, convicts to Tasmania in the 1840s or the 5 thousand women who came to South Australia in the 1850s. (See http://tintean.org.au/2014/03/06/irish-famine-women-a-challenge-or-three/ Maybe one day we can pay equal attention to these others. Why were Irish women so willing to emigrate? If strong family ties and the attractive image of Australia current in most Irish circles ‘pulled’ women to Australia, what were the things pushing them out of Ireland? What encouraged them to leave? In contrasting post-famine with pre-famine Irish society, some historians have argued for a greater degree of economic independence for women in the earlier period: their work in agriculture and domestic industry was so very important to the household economy. In summer months, women helped in making hay and digging turf and digging and picking potatoes. The wives of labourers and cottiers may have kept hens, ducks and pigs which they sold at profit. Their children, if they worked at all, worked on the family’s potato ground. Women were involved in domestic industry, making coats, breeches, stockings and petticoats for family use as well as the domestic putting-out system, mostly as spinners of yarn. But from the 1830s on, a downturn in economic fortunes and a lessening of economic independence must have persuaded more and more of them to leave. It is important, too, to recognize differences within Irish society and economy, between different parts of the country, between urban and rural districts, between the social classes, and between those who participated in a market economy and those confined to a subsistence economy. Economic conditions for those at the vulnerable end of the social hierarchy deteriorated in the period between the end of the Napoleonic Wars and the outbreak of the Famine: agricultural prices fell; the population continued to grow from 6.8 million in 1821 to 7.8 million in 1831 and 8.2 million in 1841. There was fierce and sometimes brutal competition for small plots of land upon which cottiers and labourers might eke out an existence. The domestic textile industry which had provided families with supplementary income, fell into decline. Domestic industry was an area where females contributed to family income, as spinners of coarse yarn in the West, in Mayo, Sligo and Leitrim, and as spinners of linen yarn, especially in Ulster. But the heyday for domestic industry was over by the early 1830s. By that date, it had disintegrated in the West and in Ulster, home-spun yarn was already being replaced by mill-spun yarn. In Ulster, some women did indeed find alternative employment as handloom weavers but wages were low and falling as power looms became established in the hinterland of Belfast. Throughout the 1830s and 1840s many a single young woman left her home in Cavan or Monaghan or Louth to seek work in the mills of Dundee and Paisley in Scotland. In the rest of the country, especially in the West and South-West, conditions for those in the bottom half of the social scale became decidedly worse. Agricultural productivity may have increased between 1815 and 1845 but falling agricultural prices and increasing population pressure pushed more and more of those at the lower end of the social scale to the margins of existence. Less and less land was available for those who wished to set up an independent household, and full-time employment for an agricultural labourer became a pipe-dream. Allow me to turn this argument a little. If economic conditions were deteriorating for those at the vulnerable end of the social scale in the decades immediately before the Famine, then women’s contribution to the family’s well-being became commensurately more important. Their psychological support and the nurturing and protective qualities they brought to the family became crucially important. As Lyn Hollen Lees put it, “under conditions of poverty, male underemployment, and seasonal migration, a family’s survival depended on the strength and resilience of the wife and mother”. And then came the Famine and that fragile world burst asunder. Let me say a few words about the FAMINE. I’ll begin with a couple of quotations. The first two are from an American visitor to Ireland at the time of the Famine, Asenath Nicholson, who published an account of her travels as Light and Shades of Ireland. They are quoted in Margaret Kelleher’s great work, The Feminization of Famine. Expressions of the inexpressible? The first is her response to an encounter in Kingstown/DunLaoghaire, near Dublin. …and reader, if you have never seen a starving being, may you never! In my childhood I had been frightened with the stories of ghosts, and had seen actual skeletons; but imagination had come short of the sight of this man…[he] was emaciated to the last degree; he was tall, his eyes prominent, his skin shrivelled, his manner cringing and childlike; and the impression then and there made never has nor ever can be effaced. Going out one day in a bleak waste on the coast, I met a pitiful old man in hunger and tatters, with a child on his back, almost entirely naked , and to appearance in the last stages of starvation; whether his naked legs had been scratched, or whether the cold affected them I knew not, but the blood was in small streams in different places, and the sight was a horrid one. The third quotation is from The London Illustrated News of late December 1849. Sixteen thousand and odd persons unhoused in the Union of Kilrush before the month of June in the present year; 71, 130 holdings done away in Ireland, and nearly as many houses destroyed in 1848: 254,000 holdings of more than one acre and less than five acres put an end to between 1841 and 1848; six-tenths, in fact, of the lowest class of tenantry driven from their now roofless and annihilated cabins and houses…The once frolicsome people–even the saucy beggars–have disappeared, and given place to wan and haggard objects, who are so resigned to their doom, that they no longer expect relief. One beholds only shrunken frames scarcely covered with flesh–crawling skeletons, who appear to have risen from their graves, and are ready to return frightened to that abode. It is not my intention to be melodramatic. But sometimes I wonder if family historians understand what exactly their female orphans were fleeing. The history of the Great Irish Famine is a massive and controversial subject, made all the more so by excellent works of scholarship that have appeared in the last twenty years. I don’t wish to become embroiled in these, just now. Let me instead try to identify some things historians agree on. In the autumn of 1845 Ireland’s potato crop was partially destroyed by blight, phythophthora infestans. The potato was the staple foodstuff of a large proportion of the population, particularly the cottier and labouring class. [I remember reading in Salaman’s history of the potato, I think it was, of the adult Irish labourer who ate a stone (14lbs or 6.3 kg) of potatoes per day. That and a glass of buttermilk was all he needed nutritionally. Some even allowed the nail on their thumb to grow long–as a tool for peeling potatoes.] In the harvest of 1846 and 1848 destruction of the potato was widespread. In 1847. there was partial failure but so few potatoes had been planted that year the effect was catastrophic. Two or more harvest failures in a row, and there were more partial failures in 1849 and 1850, brought unspeakable misery and death. [In my last years at Macquarie University I and a colleague directed a reading course on comparative famines for M.A. students. Central to the course was the work of the Nobel prize winning economist, Amartya Sen, particularly his theory of entitlements. I won’t go into that here. But do have a look at his Poverty and Famines. You can download it here https://www.prismaweb.org/nl/wp-content/uploads/2017/06/Poverty-and-famines%E2%94%82Amartya-Sen%E2%94%821981.pdf Suffice it to say that for Sen, and for nearly everyone nowadays, famine is about more than absence of food and starvation. The biggest killer was not so much starvation as diseases of one kind or another–typhus, dysentery, relapsing fever, scarlatina, scurvy, tuberculosis, secondary infections like measles and smallpox, and from 1849 cholera as well. Given the squalid living conditions of so many living in ‘fourth-class’ housing (a one room mud-walled cabin), overcrowding, poor hygiene, and the the lack of running water and sewerage system, it is not surprising that contagious diseases could spread with such deadly effect. Gathering in crowds at soup kitchens, at the gates of a workhouse, at a port of embarkation or on a public work scheme only made that contagion easier. Relapsing fever and typhus, for example, though it was not known then, spread by means of body lice. Dysentery and diarrhoea which killed so many in 1847, 1848 and 1849 are spread by direct contact with a sufferer, by water polluted faeces and by vectors such as flies. Historians estimate that between 1 and 1.2 million people died in the famine years before 1851 and about 1-1.4 million emigrated. And they continued to emigrate thereafter; the famine had opened the flood gates of Irish emigration. The response of the British government was inadequate. Soup kitchens, the importing of Indian corn or maize, comparatively little financial aid (9 million pounds as against 55 million pounds for the Crimean War a few years later) was never going to be enough. 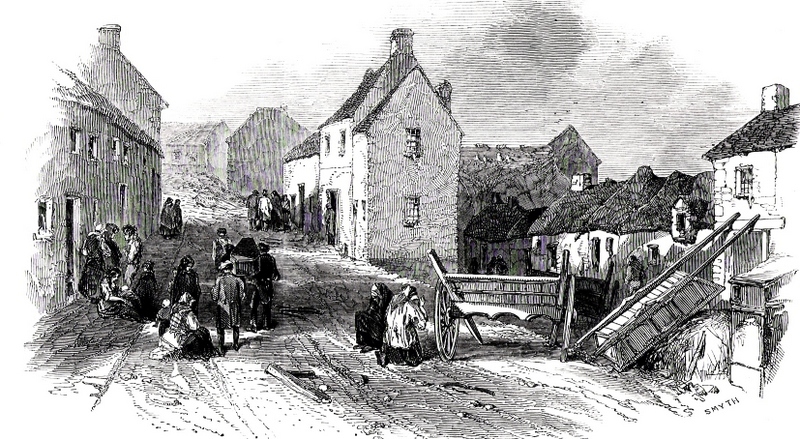 Seemingly pointless public work schemes for the listless and hungry who were paid a pitiful wage, the introduction of the quarter-acre clause to an amended Poor Law in June 1847 (anyone holding more than a quarter acre of land would be ineligible for poor relief) with its concomitant increase in evictions only compounded the problem. Government was prepared to sacrifice vulnerable people on a callous ideological altar. [Perhaps readers may not put it quite so starkly as this. Others may reflect upon governments claiming they are Christian yet willing to lock asylum seekers in a concentration camp/aka detention centre.] The apportioning of ‘blame’ and assessing the responsibility of the British government is one of the most hotly debated areas of dispute. Like most other Irish historians, I would not use the term ‘genocide’. In my view there is not enough evidence to show there was an ‘intention’ to commit genocide. Still, it’s worth having a look at the final chapter in David Nally’s Human Encumbrances. Historians do agree the impact and effects of the famine varied greatly from region to region (and indeed class to class). The basic, rather crude fault line is between West and East. Where exactly it lies depends on what you are examining; the distribution of fourth class housing (one room mud-walled cabin), death rates during the Famine, which Poor Law Unions received most from soup kitchens and outdoor relief, which Board of workhouse Guardians were dismissed during the Famine, etc. etc. For more information on this and a more nuanced identification of fault lines, see the wonderful Atlas of the Great Irish Famine, edited by John Crowley, William J. Smyth and Mike Murphy, Cork University Press, 2012, ISBN 9781859184790. I would recommend anyone interested in the Great Irish Famine have this work in their library. Generally speaking, it is clear that Mayo, Galway, Clare, or the provinces of Connacht and much of Munster were most affected by the Famine. I mention this last point for a number of reasons. The Famine was indeed a national tragedy but its harshest impact was reserved for cottiers, labourers and some of the small farming class. It was also regionally selective. Conditions in Sligo and Ballina, Tuam or Loughrea were different from Nenagh, Tipperary and Cashel and different again from Antrim, Ballymena or Carrickmacross. The memories and experience of the 110 orphans from Skibbereen in West Cork, (85 of whom went to Adelaide on the Elgin in 1849 and 25 to Melbourne on the Eliza Caroline in 1850) or the 30 from Kilrush in County Clare (who went to Melbourne on the Pemberton in 1849) would have been very different from the young women who left workhouses in Antrim, Belfast or Banbridge (who went to Sydney on the Earl Grey in 1848 and the Diadem to Melbourne in 1850. A female orphan who came from Skibbereen (Ellen Fitzgerald) or Kilrush (Bridget Miniter) or Ennistymon (Ellen Leydon) or Enniskillen (Alice and Jane Byng), or Armagh (Mary McMaster) obviously had different experiences of their workhouse and of the Famine. In some workhouses and Poor Law Unions, demands proved too much of a strain, rates were not collected, officers emigrated, died, were corrupt or inefficient and dismissed, the administration of the workhouse all but collapsed. In others, medical attendants, nurses, chaplains, Matrons, porters and Masters worked tirelessly, often at great personal cost, to combat the effects of famine and disease as best they could. Let me say some more about workhouse experience in the next post. Another reason to stress regional differences and to recommend the Atlas is that they remind us our map showing the origins of the orphans (see the start of this post) is not necessarily a reflection of the severity of the Famine. There is some evidence in the map to indicate the depths of the catastrophe among cottiers and labourers in the infertile West and the high incidence of disease and calamitous mortality or the prevalence of eviction and excessive destitution in the same Western districts. Some of the orphans did indeed come from Sligo, Ballina, Tuam, Loughrea, Newcastle, Kanturk , Killarney and Skibbereen. But given the severity of the Famine in the West we may have expected more orphans to have come from there. Perhaps our map is more likely an indication of Poor Law Guardians’ willingness to avail themselves of the opportunity presented by Earl Grey and the Colonial Land and Emigration Commissioners. I’ll keep an open mind about this. The cartographer in the Atlas, Mike Murphy, presents the map of the orphans’ origins in a different way from the one in this post. 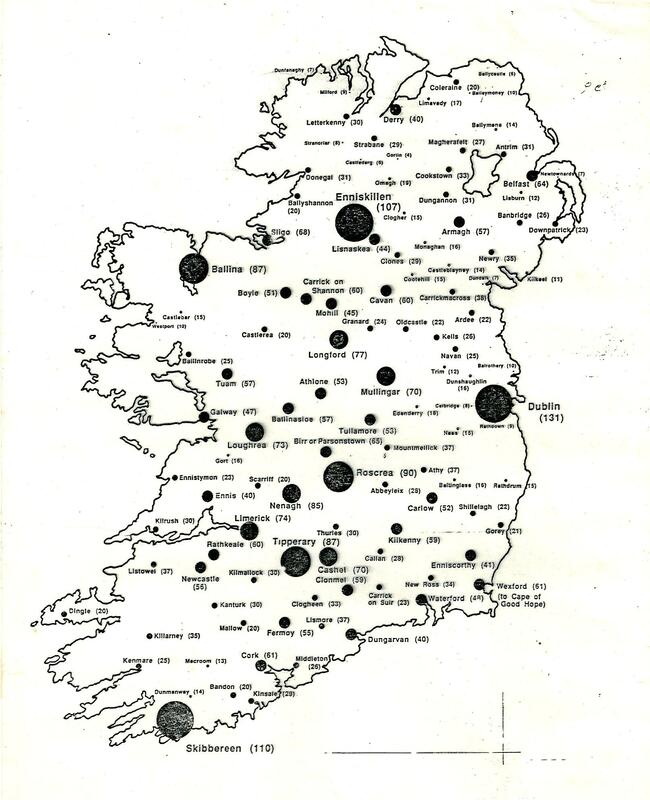 From his map it is clear the majority of the orphans came from Connacht and Munster. Let me try to come a bit closer to the female orphans by way of general background to their Workhouse experience. Later I’ll be more specific; I’ll place some of them firmly in a particular workhouse. This entry was tagged Asenath Nicholson, Atlas of the Great Irish Famine, Earl Grey orphans, Irish Famine orphans to Australia, Irish female emigration, Irish workhouses, Margaret Kelleher. Bookmark the permalink. Trevor, please re-enter the link to the visiting man from Germany who commented on what (pre-famine) the inmates wore, how many meals a day they had . . . . I meant to copy this and keep it, but can’t now see the link. It’s fascinating. Not sure what it was myself Migs. Thanks Trevor, I knew I’d read more about her on your website previously! Interestingly, Ellen’s Death Certificate doesn’t mention anything about ‘Malnutrition’ as Cause of Death! Steven, That particular piece of information may have come from Jenny Dedman of Swan Hill back in the 1980s sometime.Though i do notice i was able to go back into BDM and find precise information for some of the birth dates. That nearly illegible scrawl on the Family reconstitution form in post 53 reads ‘mother’s death cert shows Thomas dead, James decd. Father No particulars’. I must have missed what was said, if anything, about her cause of death. Hi Trevor. Thanks so much for you boundless generosity with this blog. I am on the case of Bridget Hopkins from near Dunmore, Galway per Digby 1849. My question is what were the info sources you used to get the numbers for the map in Barefoot and at the start of blog 4 re origins of the orphans. It indicates that Tuam workhouse sent 57 orphans and Galway workhouse sent 47. With many of the Tuam records 1842-1851 missing, and limited info in the Irish newspapers of the time, I am keen to know what other sources I should be investigating to try to determine if Bridget was in Tuam, Galway or even another workhouse. My recent visit to Galway helped a lot contextually but not specifically re her origins. Perhaps British Parliamentary Papers? Hi Kaye, I didn’t base those maps on Oz shipping lists which in a way would be the most accurate way. But alas as you know the information re the South Australian arrivals is incomplete. Hence I used British parliamentary papers. Somewhere in my blog I put up that info. I wonder did I put it all up. From memory it was about blog post 29. Maybe try the search box with something like emigration returns. I think I’d be looking in parishe Records to see if I could find a baptismal record. I bet you’ve done all this already. http://Www.nli.ie will take you to what survives. The maps are good there too. Even google earth will give you an idea of how close Dunmore is to a Workhouse. Another long shot is that somewhere in Oz records there’s mention of her townland…just whistling in the wind. Many thanks Trevor, will follow up the Parlt. papers link. I love whistling in the wind, as I did as I stood in the Townland of Glen (Glan/Glean/Glann) at (a) Dunmore 53° 33′ 39″ N, 8° 49′ 27″ W and (b) Kilkerrin 53° 33′ 42″ N, 8° 32′ 10″ W., following the lead on her death certificate “Glan near Denmore”. Nothing in Dunmore Parish records (they only start Feb 1833) and there are no available Catholic Parish Registers for the parish of Kilkerrin and Clonberne. As with us all, the journey continues and we learn the most amazing and sobering things about the Famine, exterminations, breaking rocks, Hedge Schools, Fenians and good and bad landlords along the way. If I ever get a breakthrough, I may even do a Bridget blog. In the meantime I have commissioned a plaque for the memorial wall in Bourke cemetery in memory of my great x 2 grandmother, as her grave is unknown. Again, thank you for your wonderful blog and your generosity in sharing what you know with us all. Did you see the workhouses for the Digby in Post 20? None from Tuam or GAlway. some from CAstlerea in Co Roscommon a few from Loughrea. Her native place may be was some distance from her workhouse. Might be worth looking at Peter Higginbotham’s great website http://www.workhouses.org to see what there is for those two.no? Yes. Great lead Trevor, thank you. Whistling in the Glen/Glan wind, perhaps barking up the wrong PLU tree (I never gave Castlerea a thought) while loudly singing “Walk on, walk on, with hope in your heart, and you’ll never walk alone.” Love a challenge. Many thanks Ian. Many of the young women from those areas in County Clare and Cork also went to Quebec after the Earl Grey scheme to Oz had ended. Barefoot 2 has the names of the young women on those two vessels you mention along with their origin, first employer and terms of employment as well as names of some interested descendants. But like those orphans on the William Stewart, the Mahomet Shah (to Port Phillip) and the Subraon (Port Jackson) they were never officially recognised as part of the Earl Grey scheme (see my queries at the end of post 5). It’s a pity they all aren’t better known. On p.403 of Barefoot 2 you’ll see that the Tasmanian Female Immigration Association was a major force behind the immigration of the women by the Beulah and the Calcutta. (rather than being officially part of the Earl Grey scheme). Those other vessels above sent a number of orphans from Foundling hospitals and the like (rather than workhouses?) before the Earl Grey scheme got under way, without the authorities in Britain publicising what was happening. It was in their interest to be quiet about the Calcutta and the Beulah too, since colonial opposition to the Earl Grey scheme was so strong by that stage. The map showing the origins of the Earl Grey female orphans is based on what was officially recognised. It’s a bit of hairsplitting i agree. There’s some excellent stuff on Kilrush in the BPP too–Kilrush and Carrick-on-Shannon enquiry 1850 (XI) or the Report of the Select Committee on Kilrush Union 1850 (in 613) XI and indeed on the Causes of Mortality in some Clare Unions Jan- May 1851 BPP 1851 vol XLIX. Many thankyous for the link. Still waiting for Volume 2 of Barefoot & Pregnant? to arrive. It wasn’t available at my local library (Geraldton WA) so they are getting it in for me. In the meantime I can help to fill in the some of the gaps in your map at the beginning of this Blog. The orphan girls who were sent out to Tasmania in 1850 all came from Workhouses in the south and west of Ireland. On the “Beulah” there were 44 from Kilrush, 50 from Ennistymon, 55 from Ennis and two from Ballyvaghan. Aboard the “Calcutta” were 40 from Scarriff, 30 from Tulla, 30 From Killadysert, 20 from Corrifin, and 20 from Cork. Also of interest to you may be the eyewitness report on conditions at the Kilrush Workhouse in February 1850 by the highly esteemed Doctor Richard Robert Madden. you can find id it at https://archive.org/stream/memoirschieflyau00madd#page/242/mode/2up pages 243 – 254 . The report was never published because Madden kept his silence in return for improved conditions at Kilrush. I have transcribed this too, if you would like a copy i”ll send it to you. Just had a thought. Why don’t you yourself do a “blog” on the Calcutta and Beulah women. I’m sure it’d be good. Barefoot and Pregnant? Vol.2 finally arrived yesterday after making it all the way from the Port Phillip library to Geraldton. Imagine my chagrin when I found my Great-grandmother’s name missing from the Beluah’s Passenger list in the book! She is the the very first on the original list, although her surname appears to be spelt Warrent (http://stors.tas.gov.au/CB7-11-1-1 (Image13)). However, in the Nominal Register Of Immigrants’ Arrivals With Details Of Age, Marital State, Literacy, Native Place, Trade, Employment And Wages, (http://stors.tas.gov.au/CB7-13-1-1 (Page 17)) it is spelt Warrant. She was employed by James Erskine Calder who was the Assistant Surveyor General at the time. We encountered further confusion because the Reverend Doctor Fry also misspelt her name, this time Warren. Likewise the birth records of her first two children the spelling is Warren but for the other nine (including my grandfather’s) the spelling is Warrant which we have determined is correct. One of the family had a photograph of her which also matches one held at the Tasmanian Archives. Further research uncovered the date that her family was evicted from their home in Creegh South, County Clare where she lived with her father, mother and brothers. I have managed to put together her story and you can find it on the Clare Library website (http://www.clarelibrary.ie/eolas/coclare/genealogy/don_tran/fam_his/mary_ann_jane_warrant.htm). As a result of my research I have been able to contact descendants of all but one of her children who survived and raised families of their own. A chilling account of conditions reigning at the Kilrush Workhouse was written in February 1850 just three months before the “Beula” orphans were sent out to van Diemen’s Land and can be found at – http://www.clarelibrary.ie/eolas/coclare/history/report_kilrush_workhouse_1851.htm . Quite possibly my great-great grandmother was an inmate of that institution at that time. By the way, I quite like your idea of a blog, but I have other projects, including a book, that are taking up most of my time at present. It seems to be a fact lost to history that after the end of the so called Earl Grey Scheme, a similar scheme was started, administered by the third Earl Grey, Henry George Grey, who had been appointed Secretary of State for War and the Colonies by his father. This was as a result of a request by the administration of Van Diemen’s Land. The scheme was discontinued after only two ships, the Beulah and the Calcutta had transported 293 girls and young women to the Island. Many of these came from the west of Ireland including Co. Clare. The passenger lists of those ships are held in the Tasmanian Archives along with comprehensive list of who they were initially employed by. They are also available on line. Ancestry.com also have them in their Immigration Records where the are more easily referenced. The ancestry records have incorrectly transcribed the name Beulah as Benlah. I have also transcribed the two shipping lists with the addition of the workhouse each came from as recorded in the margins. I am more than happy to make them available to aid your research. My special interest is that my great-grandmother was one of these young women, she came from the notorious Kilrush Workhouse in Co.Clare. You might like to have a look at volume 2 of my Barefoot & Pregnant? pp.403-20. The penultimate par on p.403 is interesting. I’m off to the library now, I hope they have it there. Hi Ian. I believe my my husband’s Great something grandmother arrived on board the Beulah. Her name was Bridget Vaughan. I think she might have come from County Clare. I’m currently away. I would be interested in you had any background information on her. I did a stint in Geraldton about 15 years ago and worked at the Chamber of Commerce. I think my hair is still recovering from the strong winds. According to the passenger list there was one Vaughan aboard the Beulah. She was from the Ennistymon Workhouse.